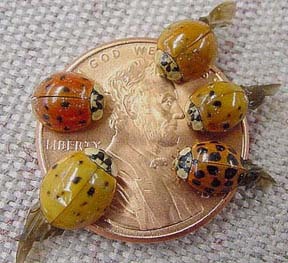 Lady beetles or ‘ladybugs’ are not always considered beneficial insects, worthy of protection. While orchardists, gardeners and farmers might consider finding a lady beetle a sign of good luck because they feed on many serious plant pests, homeowners are becoming far less enchanted. With the appearance of literally thousands of annoying and smelly lady beetles flying and crawling inside a home or garage during late fall or winter, the words “beneficial,” “conservation,” and “protection” seem to be the last that come to mind. The particular species of lady beetle that has become a home invading pest is new to our area and is called the Asian Lady Beetle (Harmonia axyridis). This species looks like most other lady beetles (oval, convex, and approximately 1/3 inch long). However, body color varies dramatically among Asian lady beetles. Different color variations, from yellows to reds, can be found within a single handful of beetles. Many have black spots; some have many, some have few and some lack spots altogether. The most apparent identifying character that Asian lady beetles share is a black ‘M’ inscribed on their thorax, just above the wing covers. Some M’s are darker and more obvious than others, but their presence is almost always a good diagnostic tool. 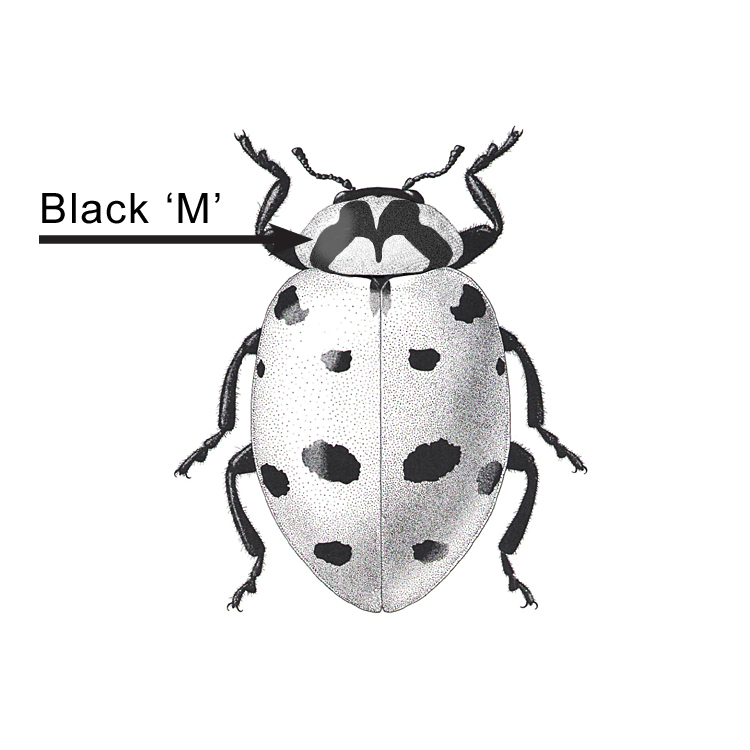 Black 'M' on thorax is characteristic of the Asian lady beetle. While this species, like many others in our area, is effective in controlling some pests out-of-doors, it has the unusual habit of congregating in large numbers on and in buildings during the late fall. Asian lady beetles are most attracted to buildings where abrupt color contrasts occur in a longitudinal fashion. For example black shutters on a white house, dark windows on a light colored house, or light colored gutter drain pipes on a dark house. For this reason, beetles usually first appear on the southwest-facing sides of light-colored buildings, close to wooded areas. -	clusters of like lady beetles. Congregating begins in mid October and usually reaches its peak by the end of the month. Congregation usually is initiated by the first cold weather snap in October that is followed by warm temperatures. During this congregating activity, hundreds of thousands of beetles may appear around homes, creating a serious nuisance. When outside temperatures fall, the beetles move into tight cracks and crevices, such as under siding or in wall voids, or cluster tightly into the corners of attics or garages. Once there the beetles eventually find their way into the home through small cracks or openings, in window sills, door jams or foundations. There the beetles essentially remain in a hibernation-like mode for several months. Because the beetles are out of sight during the winter months, homeowners are often fooled into believing that the beetles are gone. That is, until the first warm days of late winter or early spring, when the beetles seem to come to life again and begin crawling about. At this time the nuisance factor intensifies because the beetles are attracted to the living areas of the home where temperatures are more moderate. Clusters of several hundred to thousands in living rooms, bedrooms, or kitchens are not uncommon. It almost appears that there are more beetles at this time of year that there were in the fall. Rest assured, however, that the beetles have not increased in number over the winter months. Beetles have merely concentrated and shifted indoors. Lady beetles have become a serious nuisance pest inside buildings. They do not directly damage anything in the home, do not infest stored food and do not destroy household furnishings. Their presence is simply an annoying nuisance. Not only do Asian lady beetles become a nuisance by flying into living areas, dropping from light fixtures, and bumping into people but they also release a foul smelling material when handled or disturbed. Some homeowners have also complained that on very warm days, especially when a person is perspiring, that the beetles pinch when they land on bare skin. Why this phenomenon occurs is not completely understood but the pinching does not break the skin therefore disease transmission cannot occur. A more serious threat may be that if accumulations of dead beetles are not cleaned up, particles of dried and crushed beetle bodies may become airborne and complicate allergies or asthma if inhaled by occupants. Control options depend, to a large extent, on the number of beetles and the level of tolerance by occupants in any given home. Sweeping them up and disposing of them may be the best option for a few beetles. Vacuuming also will work and nozzle extensions will allow access to those on the ceiling or in hard to reach places; however, be sure to empty the vacuum bag afterwards because live beetles can sometimes find their way out of a vacuum left in the closet. Unfortunately, the beetles seldom all arrive or become active at exactly the same time. This may take place over several weeks, depending on temperatures and the size of the population. Removing those that appear every day can become a real chore, especially where populations are high. It may seem like there is an endless population or that they are somehow multiplying in the home. Rest assured - they are not. Sometimes, chemicals can be used to assist homeowners in controlling Asian lady beetles. Using chemical sprays or “fogs” labeled for inside the home will kill exposed Asian lady beetles. However, beetles still secluded or in wall voids will be unaffected. In addition, the dead beetles will still have to be removed after they die, which can be a job that is just as disagreeable as removing live beetles. Professional pest controllers can be employed to use chemicals such as synergized pyrethrins in attic or crawl spaces (aerosol type foggers are not recommended in other areas of the home). Using pesticides as a perimeter treatment during late fall will also help prevent beetles from getting into the home. Use materials that will leave a long lasting residue. Wettable powders, micro-encapsulated and suspended concentrate formulations seem to work best. On the outside of the home, pest control operators have used long-lasting/rapid knockdown chemicals such as Demand or Suspend with excellent success. Talstar, Tempo, or Demon may also be used. These materials may afford protection for up to 1 month, depending upon the site of application. Homeowners may use a number of products at rates labeled for “household invading” or “occasional pests” including; bifenthrin, deltramethrin, cyfluthrin, tralomethrin, and esfenvalerate. The key to control is to apply the chemicals to the outside of the home in October while the beetles begin to congregate but before they enter the home. In most circumstances, a combination of several control methods is the best answer to Asian lady beetle problems. Preventing beetles from entering the home is the best and most effective control practice. 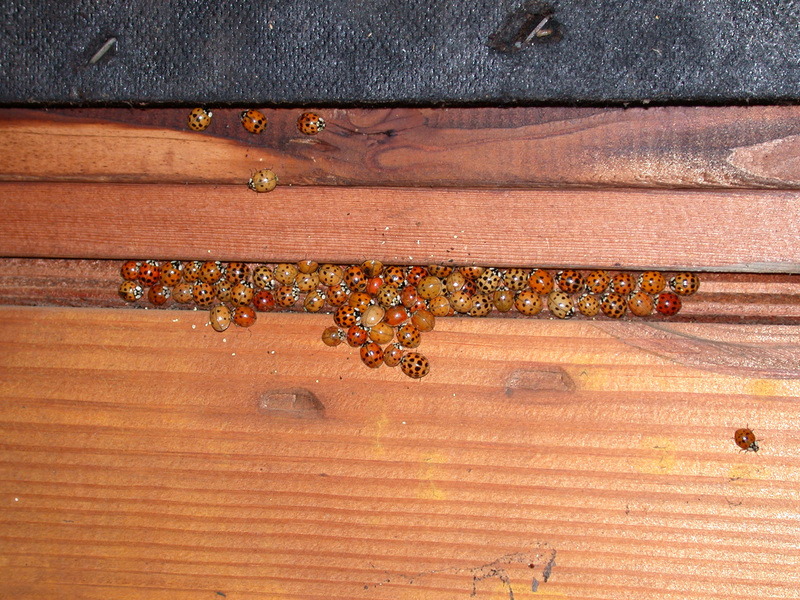 Sealing them out by caulking cracks and around utility service openings, fixing broken window screens and door jams, plugging cracks in the foundation or roof, and other similar exclusion-type activities will help prevent the lady beetles from entering in the first place. Physically removing the beetles as described above with a vacuum or sweeping them out is always a good control method. A combination of several control methods is the best answer to Asian lady beetle problems. (1) Seal them out by caulking and repairing openings. (2) Use pesticides as a perimeter treatment. (3) Use indoor labeled pesticides to provide temporary control. (4) Vacuum or sweep them up. There is no doubt that the Asian lady beetle is helping to control aphid and scale infestations. What is unclear is whether this benefit outweighs the negative aspects of its overwintering behavior. Regardless on how one might answer that argument, the important point for homeowners is the fact that the beetle is here to stay. And because the Asian lady beetle is here to stay, we must learn what we can in order to live with it. Experience has taught us that populations of any newly introduced insect, pest or beneficial, increase very quickly in the first few years after introduction. This is due, in part, to the fact that while the insect was introduced from a foreign country, the naturally occurring diseases, parasites and predators that keep it in check were not. These usually follow any new introduction, but there may be a lag time of several years. Even now, we are beginning to see beetle numbers level off and gradually decline in some areas. We expect this trend to continue.